No doubt justifying all space-based budgetary expenditures for the next century, NASA scientists have discovered a new ring around Saturn. 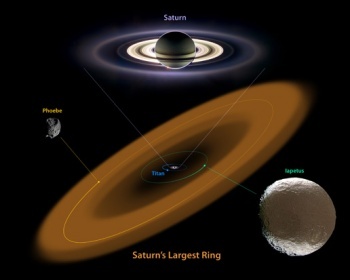 The really bizarre bit is that though humanity has known of the ring-infested planet since prehistory (and its rings since at least the 17th century), this new ring is described by NASA as "by far the largest of the giant planet's many rings." You'd really think something like that would be hard to miss. So what does this mean for humanity? Not much really, but you better believe certain other planets are jealous. Saturn gets all the shiny, fancy rings and Uranus just gets s#! * on!